The Monkey King and his monkey friends monkey around in Uproar in Heaven. 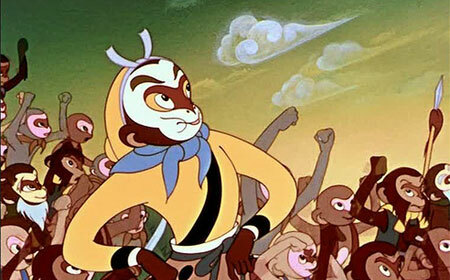 The Skinny: The Shanghai Animation Film Studio’s long-in-development animated follow-up to the black-and-white Princess Iron Fan is a full-color adaptation of a different installment of Wu Cheng-En’s Journey to the West, this time detailing the Monkey King’s rebellion against the forces of heaven. Vibrant, funny, and rousingly entertaining, Uproar in Heaven is a joy to watch all these years later, fully deserving of its status as a true classic of Chinese cinema. Review by Calvin McMillin: The famous Wan brothers – Laiming, Guchan, Chaochen, and Dihuan – are the creative team responsible for the very first animated film in Chinese history, Princess Iron Fan, back in 1941. A follow-up was planned, but a turbulent political climate in China delayed production on the film for more than two decades. The finished project, known as Uproar in Heaven, was developed in two parts. The first was completed in 1961, while the second part was finished in 1964. One year later, both portions were screened together as a single film. An amazing tour-de-force, Uproar in Heaven turned out to be well worth the wait, as it’s a certifiable animated classic sure to entertain viewers of all ages. Directed by Wan Laiming, the film adapts the first part of Wu Cheng-En’s classic novel Journey to the West, which explores the origin and ascension to power of the mega-popular cultural icon Sun Wukong, a.k.a. the Monkey King. When Wukong breaks a sword during a practice demonstration at his home on the Mountain of Flowers and Fruit, one of the elder monkeys advises him to seek the help of the Dragon King of the Eastern Sea. After travelling to the underwater kingdom, Wukong is told by the Dragon King that he can pick any weapon that he likes. But since each weapon leaves something to be desired, Wukong decides to claim a giant pillar that fixes the sea in place. At one hundred feet long and weighing in at eighteen tons, this isn’t your average Chinese staff. Wukong takes the pillar, shrinks it to a more manageable size, and departs. Infuriated by the Monkey King’s “theft,” the Dragon King begs the Jade Emperor to punish Wukong. Rather than engage the mischievous Monkey King in a direct confrontation, the powers-that-be decide to appoint him to a largely meaningless position within heaven’s bureaucracy in order to keep an eye on him. But when Wukong learns that being “The Protector of the Horses in the Heavenly Stable” isn’t the prestigious job he’s been led to believe, he revolts against heaven, setting off a series of events that culminates in all-out war. Unafraid, Wukong returns home and gathers his forces, flying a banner that reads, “Great Sage Equal to Heaven.” This blasphemous display of arrogance provokes the Jade Emperor’s ire, and the armies of heaven rain down on the Mountain of Flowers and Fruit. In practically any other mythological tale of this kind, a war against the entire army of heaven would be a battle that would be doomed to fail. Not to spoil the movie, but let’s just say Wukong fares a little better than ol’ Lucifer in Christian mythology. Uproar in Heaven is such a vibrant, lively adaptation of the Monkey King legend that it has become one of the “canonical” interpretations of the character, influencing scores of live action, animated, and comic book versions of Journey to the West ever since. The film is leaps and bounds ahead of its predecessor, Princess Iron Fan, full of top-notch hand-drawn animation and a wonderful incorporation of Peking Opera music scoring each major scene. You simply don’t see this kind of craft anymore. If there’s one complaint I could lodge against the film is that its ending leaves out the most important aspect of Wukong’s rage against the heavenly host. While it’s loads of fun to watch Wukong wreak havoc on a bunch of pompous celestial beings who probably deserve a little roughing up, the fable’s larger message about the importance of humility is lost in the film’s blow-out ending. Granted, that aspect of the story was probably intended for the next installment (the storybook adaptation definitely suggests this), but the absence of Wukong’s confrontation with Buddha himself leaves the film ending on a morally ambiguous note. If a direct sequel was planned, it never came to fruition, as Mao Zedong’s Cultural Revolution henceforth turned the animation industry into a purely propagandist tool. Notes:  Foreign Language Press published a ten-volume adaptation of Journey to the West, illustrated in the style of Uproar in Heaven and translated into English. Each volume collects three stories, although this reviewer owns a previous printing of the series, which published them as thirty separate volumes. 2nd Chinese Film "Hundred Flowers Festival"
Gull Multimedia International Co., Ltd.